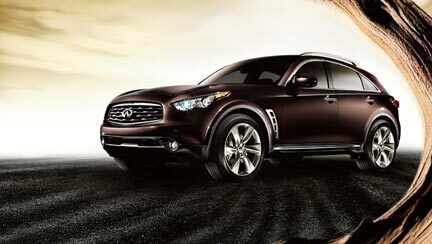 The powerful Infiniti FX, Infiniti's iconic performance crossover, enters the 2011 model year with a few important enhancements - including standard power rear liftgate (late availability) and one new exterior color. FX is again available with a choice of a 390-horsepower 5.0-liter 32-valve DOHC V8 engine with VVEL (Variable Valve Event & Lift) or with a 303-horsepower 3.5-liter 24-valve DOHC V6. Both engines are paired with a standard 7-speed automatic transmission featuring Adaptive Shift Control (ASC) and available solid magnesium paddle shifters. The FX is also offered with available Intelligent All-Wheel Drive (standard on FX50), double-wishbone front/multi-link rear suspension and large 4-wheel disc brakes, along with available Continuous Damping Control (CDC), Rear Active Steer, Intelligent Brake Assist and 6-spoke 21-inch super lightweight aluminum-alloy wheels (FX50 Deluxe Touring Package). Inside, the FX interior provides a warm, modern, inviting environment highlighted by a driver-oriented cockpit with intuitive controls, available sport seating and advanced audio, navigation and technology ranging from an 11-speaker Bose-developed audio system to Infiniti Intelligent Key, available Intelligent Cruise Control (Full-Speed Range) and available Around View Monitor system. The Infiniti Hard Drive Navigation System includes an 8-inch color touch-screen display, Lane Guidance and 3-D building graphics. For 2011, a new black lacquer interior trim is standard on FX50. The 2011 FX is available in three models: FX50 AWD with 5.0-liter V8, FX35 AWD with 3.5-liter V6 and FX35 RWD with 3.5-liter V6.